Do you have a tournament coming up and need a printable bracket? Look no further than PrinterFriend.ly. Whether you’re organizing your own tournament, playing in the tournament itself, or are an awesomely supportive parent or friend following a team, you’ll need a printable bracket to keep track of the field. With a blank tournament bracket you can stay on top of the latest games and get a sense of the larger tournament standings with any one of our printer-friendly brackets, which all come in a variety of layouts and formats. What is a 11-Team Bracket? Tournament brackets vary in size based on the amount of teams participating. A bracket with 11 teams won’t work out as evenly as a 4, 8, 16, 32, or 64 team tourney would. In addition to needing an even number of teams, there needs to be an equal number of brackets as teams advance past the first round. That’s to say with eleven tournament teams, you’ll need play-in games because of the odd number of teams in the first round as well as the odd number of advancing teams moving into the next round — which means some teams wouldn’t not have a match up. Take a look at the bracket sample to get a visual of what we’re talking about. You’ll see how the tournament will progress from the first round to the second round and beyond. Our single-elimination, eleven team downloadable brackets comes in a variety of options! You can download and print them out in PDF, full-size image (JPG) or in Excel. The bracket we have in this post is one-sided, already-seeded and designed for a single-elimination tournament. As you can see from the image below, an 11-team tournament will require 3 play in games to initiate the tournament. Download our 11 team printable tournament XLSX bracket or click on the following for our 11 Team Printable Tournament Bracket PrinterFriendly PDF here! With our brackets, they’re not limited to just basketball, volleyball or soccer tournaments. 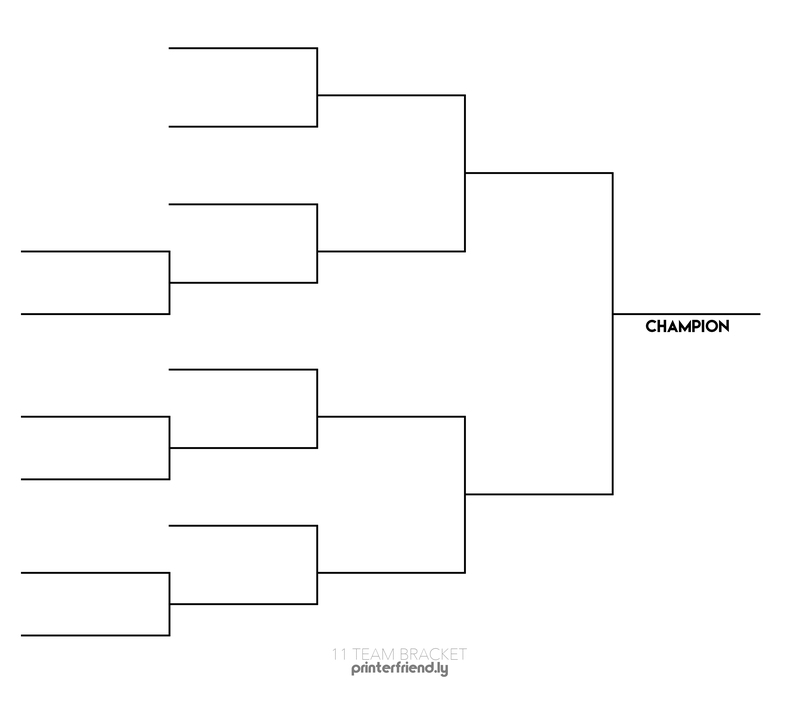 If your tournament is single-elimination then our printable, blank brackets meets those tournament requirements. To get a sense of when and where our blank brackets will work with, this is a list of team sports that users that have downloaded our brackets: softball, basketball, kickball, football, hockey, baseball, lacrosse, rugby, dodgeball, handball and tournaments like March Madness and the NFL playoffs. These brackets can even be downloaded for some individual sports such as tennis or wrestling. Again, it would have to be single elimination.